The Eternal City and the Capital of the World, Rome boasts some of the greatest art and structures from the old world. 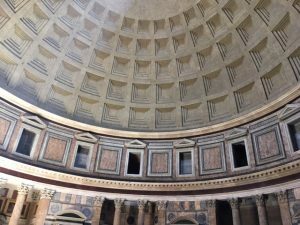 You will find the Colosseum, the Pantheon, Vatican City, and countless other treasures. If you see any of these attractions, you are standing where ancient Romans once stood; through observation, you are experiencing the legacy of thousands of years that is Rome. Merely learning about the city can change your perspective, but if you’re not careful, Rome will completely change your life. The contrast of cool and warm between the ceiling and walls in this section of the Vatican is a spectacle. Observation is tricky because you everything you observe is merely a perspective, and it could affect anyone differently. My high school history teacher knows a lot about these famous buildings, and yet, he remains largely unchanged by this knowledge. Most history teachers can regurgitate dates, names, periods, and architecture. Most history teachers can talk for hours about the information entombed within and around these attractions. Most history teachers can describe in detail the appearance of works. However, there are a few things my teacher can’t do, and that has made all of the difference. 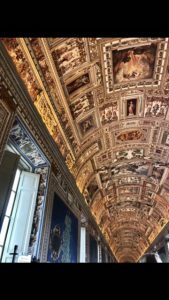 Unlike me, my teacher doesn’t know what the inside of the Sistine Chapel smells like, my teacher hasn’t twisted his ankle on the difficult stone paved roads, my teacher can’t describe the warmth felt from the sun when standing in the center of the Pantheon. My teacher hasn’t been anointed by the water of ancient fountains created by competing artists. My teacher hasn’t leaned against the remaining bricks of the Colosseum to catch his breath. My teacher hasn’t heard the sounds of wildlife while walking along the Appian Way. The perhaps unfortunate thing is, until he experiences Rome firsthand, he will never know anything more than a computer with a textbook would. He will get all the answers correct on the test, but he will never feel transported to another time in another universe, eons away but still being carried in pieces by the wind of an empire that once ruled the world. In my time here, I have cried countless times. There are some things in this life that can only be felt. The sheer beauty of both the small and big things has blown me away entirely. I feel as if I have a renewed appreciation of life and what it means to be a human, and no amount of guides or history textbooks could have prepared me for my stay in Rome. Carpe Diem. Seize the day; if there’s something out there you have read or heard about, then don’t settle for articles or vlogs. Millions of years of creation are scattered densely throughout the planet, and we only have a finite time to realize our greatness before it’s over. Intimately experience what life has to offer because surviving won’t matter if you’re not living. 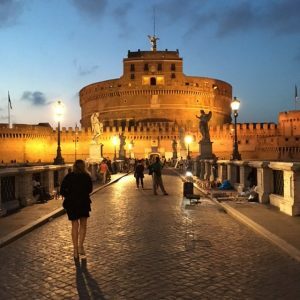 Originally a mausoleum, Castel Sant’Angelo is now a vibrant tourist attraction with deep roots in the city of Rome. Brayden is a SAI Rome summer 2018 student who is entering Columbia University this fall.